New York-based Australian comedians Scott Dooley and Jason Chatfield return for their first live podcast for 2019. The guys will be joined by a HUGE special mystery guest: a Hollywood movie and TV celebrity to be revealed on the night. Other Live Podcast guests have included Comedy Central/Netflix’s Roy Wood Jr and long-time New Yorker Cartoon Editor Bob Mankoff. Come along for a show full of jokes, live cartoon drawing on the big screen and deep rumination on New Yorker cartoon ideas over a couple of beers, along with cartoon live idea suggestions from you, the audience. Doors 9:00 PM, show 9:30 PM. Picture This! is honoured to be back for another year at the New York Comedy Festival! COMEDY BY: Adam Conover, Jo Ann Firestone, Aparna Nancherla, Sam Jay, Marcella Arguello, Rae Sanni & Music by Free The Mind! ANIMATION BY: Bryan Brinkman, Dan Pinto, Jason Chatfield, Victoria Elena Montes, Ray Alma & Irene Morales! 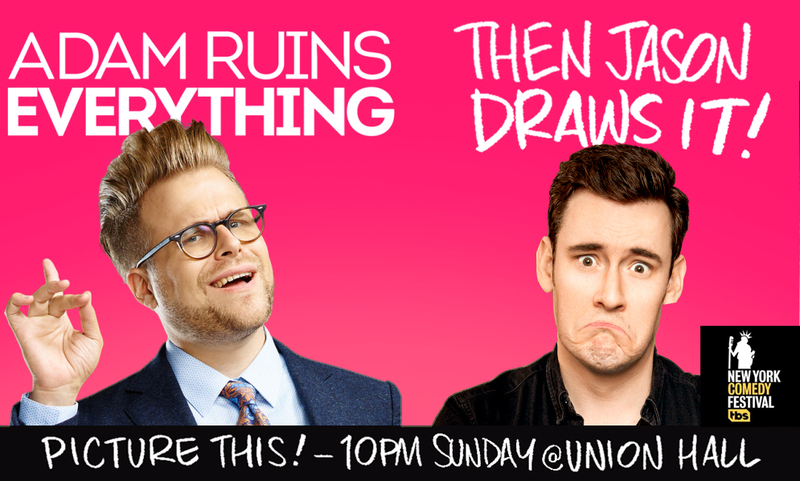 This year I'll be drawing for Adam Conover from TBS's Adam Ruins Everything. PICTURE THIS! is a new show from Brandie Posey & Sam Varela: two girls who want to push the boundaries of what a comedy show can be. Picture This! is a live comedy show with stand-ups performing while they are drawn live by some of the best animators, cartoonists, and other artists in Hollywood, CA, SF, NYC and Portland. Picture This! has also debuted in Toronto, New Zealand and Australia! The comedians don’t know what the animators are drawing and the animators don’t know how the comedians will react. But it will be FUNNY! Footnote: It was such an epic show! Thanks so much to everyone for coming out. I couldn't think of a better pairing than yours truly and the incredible Matteo Lane and Sean Patton for this Saturday night's Picture This! at the FINAL Eugene Mirman Comedy Fest! Also featuring: Reggie Watts, Sean Patton, Clare O'Kane, Mehran Khaghani & Dulcé Sloan with animation by Bryan Brinkman, Dan Pinto & Rachel Gitlevich! Matteo is one of my favourite New York comedians.